The Changing Role of the Citizen Developer - skybow webinar. 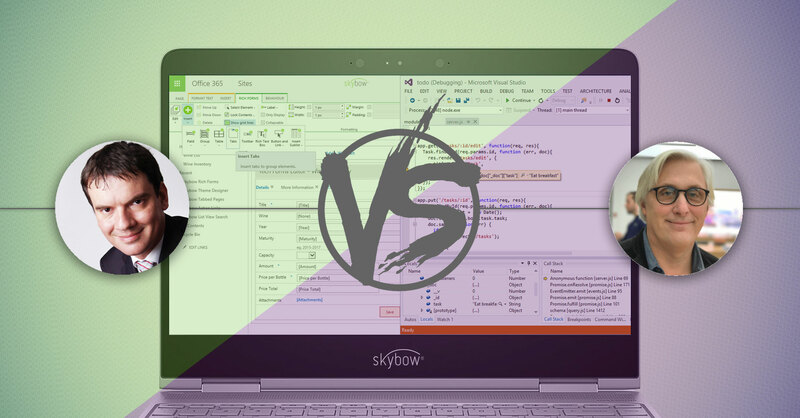 The Changing Role of the Citizen Developer and Client Side Development in "Modern" Office 365 – skybow to the Rescue? Two SharePoint developers and Microsoft MVPs - Marc D. Anderson, developer legend, the very first SharePoint client development evangelist and the creator of SPServices, and Adis Jugo, Director of Product Technology at skybow, and software architecture junky - explored client development possibilities (and opportunities!) for Office 365 and SharePoint Online, and the everchanging role of citizen developers, whose importance increases from day to day. This webinar was packed with examples, and even live solution development: Marc and Adis took a real customer use case, analyzed it, and showed the solution development process from all aspects. Rock 'n' roll. Does skybow Solution Studio have the ability to create post save actions like sending email after saving? Yes, it does. It is very easy to reconfigure save buttons, or to create custom buttons with actions which can execute any number of custom post-save actions which might be needed. The issue about this way of development is how to maintain the applications. Do you have a plan how to deal with this problem? Not only a plan, but a solution, actually. The skybow Solution Studio Package and Publish functionality gives a full-scale ALM support for maintaining packages, deployments and upgrades. It is very easy to track packages and deployments, perform updates, and any other action from the ALM spectrum. For more info please read this blog post (https://www.skybow.com/blog-en/package-and-publish-in-skybow-solution-studio-online) or watch this video (https://www.youtube.com/watch?v=0dKA3o5YQ1s). If a SharePoint Online implementation uses a branding package, will this cause a problem for skybow Designer? Are you planning to support responsive forms? Yes, the answer will be modern forms. We are working on it to support for modern pages and modern lists and libraries gradually.